RM running back dodges the Wildcats to score a touchdown. On Friday, September 22, the RM varsity football team faced off against the Walter Johnson Wildcats for their annual homecoming game. In an impressive display of speed and talent on the ground, the Rockets silenced the Wildcats 41-0 in front of a roaring home crowd. The Rockets led with an electrifying run game, sending an early statement with a 46 yard touchdown run barely a minute into the game. The Wildcats would have no answers on offense, with a promising drive dashed by a fumble at their own 48-yard line. Another touchdown run from the home team followed, making the score 14-0 by the end of the first quarter. The defense proceeded to make a crucial stop on 4th and 6th, forcing a turnover on downs at their own 30-yard line, again preventing the Wildcats from getting any points on the board. This would be followed by yet another Rockets touchdown run with 10 minutes until halftime. 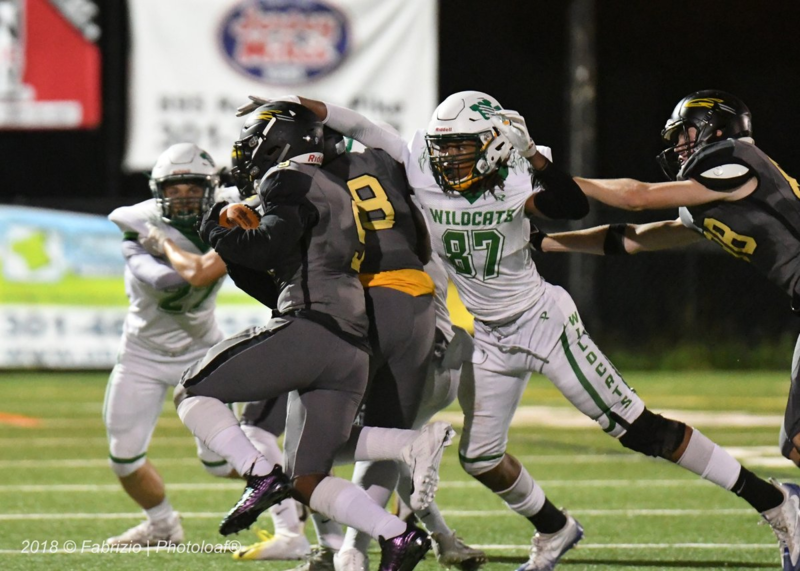 Despite their best efforts, Walter Johnson failed to find the right balance in their passing game in the first half, having scored no points by intermission. Their defense also struggled to handle the non-stop aggression from RM, giving up another easy touchdown and handing the Rockets a seemingly insurmountable 28-0 lead at the half. Running back junior T’Kai Ayoola of the Rockets was unstoppable in the first half. He had accounted for nearly 200 rushing yards and all four of the Rockets’ early touchdowns. The offense was able to find the right balance of run designs, giving Ayoola opportunities to make a play with the ball. The Wildcats came out of the break recognizing the need to control the clock, and while they did a significantly better job slowing down the game, their offense continued to struggle putting up points. RM was not able to capitalize on these opportunities with a scoreless third quarter, but the damage dealt in the first half had already been set in stone. The fourth quarter featured more of the same dominance from the Rockets, with Ayoola running in another 30 yard score, finishing the game with 251 yards and five touchdowns. Backup running back sophomore Nick McCarthy ran for the Rockets’ sixth touchdown score, this time for 20 yards, with just minutes remaining in the fourth quarter. “The win feels good, a 41-0 win where everybody played really well, everybody got to play in the game, and with such a big lead, we’re able to reward everybody to get in the game,” Coach Klotz said. Despite being outshined by the team’s offensive firepower, the RM defense too had a dominant night. Walter Johnson had come into the game averaging 35.5 points per game, which was headed by a solid passing game. In a losing effort, the Wildcats were only able to put up 200 passing yards and their quarterback was only able to complete 50 percent of his passes. Multiple turnovers in RM territory were equally damaging, which led to 14 RM points from turnovers. However, the Rockets did not play a perfect game either. Although Ayoola did an exceptional job running the ball early on, the passing game failed to make a major impact, both in this game and overall during the season so far. Although quarterback junior Michael Braswell has been a phenomenal play manager, constantly scrambling out of the pocket, he has completed less than 50 percent of his passes. Over the past three weeks, he has put up 160 yards, two touchdowns, and three interceptions. RM will be facing off against Northwest in their next game on October 12.